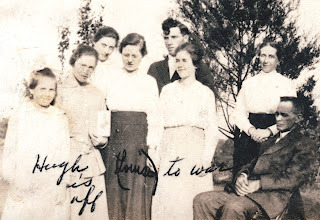 I conclude my three-part series on Rachel Shiflet with some details of her life after she left the family of my great-grandparents, Jesse Allen and Lavina (Barr) Vore. To my knowledge, though it is admittedly limited, Rachel disappeared from my family’s awareness when she left their home sometime toward the end of 1920, presumably to be reunited with her birth family after a ten-year absence. I can only imagine the trauma this would have likely caused this twelve-year-old girl who probably had no memory of her birth parents. In family history research, knowing where a person has been can help us determine where they might later have gone. The regular, ten-year rhythm of the United States Federal Census is one of the basic pulse points for determining a person’s whereabouts. The fact that we found Rachel in the 1910 Census while still living with her birth family, before she came to live with the Vores, proved a key to unlocking where she went once she left them. From the 1910 Census, I was fairly confident that Rachel’s parents were Frank and Emma Shiflet. The first census enumerated after Rachel’s departure from the Vore family was that of 1930. However, I was unable to locate any Rachel Shiflet in the 1930 Census, when she would have been roughly 22 years old. Had she died? Or had she gotten married? The key to the answer proved to be her parents. Searching Ancestry.com, I found a Frank and Emma Shiflet living in Hartford, Van Buren County, Michigan, in the 1930 Census1. Their ages matched that of Rachel’s parents, as did their states of birth, and their ages at first marriage (twenty for Frank, and seventeen for Emma). But Frank was not the head-of-household, instead listed as Father-in-law. He was living in the home of twenty-five-year-old Ora Alexander. And Ora’s wife: twenty-two-year-old Rachel Alexander. This is fairly convincing circumstantial evidence that we have found Rachel Shiflet, now married (from age seventeen, like her mother). Further evidence is that this Rachel was born in Indiana, as was Rachel Shiflet. Both Ora and Rachel are listed as laborers at what appears to be an “artificial foliage factory.” And they are the parents of a three-and-a-half-year-old daughter, Hazel M. Alexander. Since the 1940 US Federal Census will not be released until 2012, it is not possible to trace Rachel further in the Census at this time. In the search for other records on Rachel Alexander, I turned to FamilySearch, a largely free LDS genealogy Internet resource. And there I found an entry for Rachel’s death on August 30, 1960, at 52 years of age2. This particular entry only provides a partial transcription of data from the record, and does not provide an image of the original death certificate from which it was presumably taken. So my confidence in its accuracy is less than if I could view the actual document itself. No cause of death was transcribed. However, the names of her parents are provided, including her mother’s maiden name (Emma Yaw). It also provides her exact birth date (9 January 1908) and her place of birth (South Bend, Indiana). It also confirms that she was married to Ora Alexander. So as my series on “Whatever Happened to Rachel Shiflet?” comes to a conclusion, it is clear that we have only scratched the surface of her life. We have constructed a framework that enlarges the picture we have of her beyond the ten-year period in which she lived with my grandmother and great grandparents, but still we have little more than the dimensions of the canvas. That is part of the mystery and lure of family history: finding clues that lead to facts and details, that in turn add brushstrokes to that canvas, providing depth, color, and vibrancy to a life once lived. Rachel’s life is still largely a mystery to me, but I now have several leads for future research. 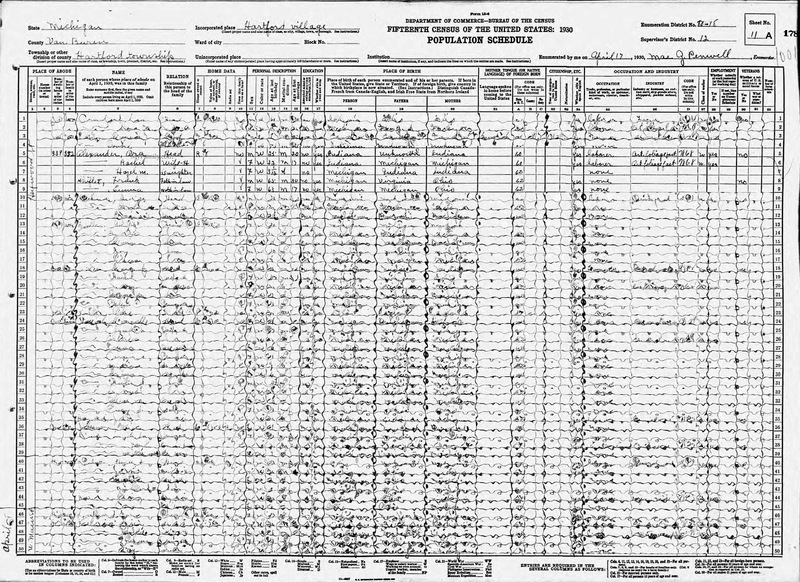 “1930 United States Federal Census Record for Rachel Alexander.” Index and images, Ancestry.com (http://www.ancestry.com/): accessed 11 April 2011. Entry for Rachel Alexander, living in Hartford, Van Buren, Michigan, 1930; reference Roll 1028, Page 11A, Enumeration District 18, Image 956.0. Original data: United States of America, Bureau of the Census. Fifteenth Census of the United States, 1930. Washington, D.C.: National Archives and Records Administration, 1930. T626, 2,667 rolls. "Michigan Death and Burials, 1800-1995." Index, FamilySearch (http://familysearch.org): accessed 11 April 2011. Entry for Rachel Alexander, died 30 August 1960 citing Death Records; reference 893, FHL film 1,954,714; Index entries derived from digital copies of original and compiled records.